OTTAWA–Prime Minister Stephen Harper’s jet-setting fall tour won’t include a stop at a global climate-change summit in Copenhagen next month. 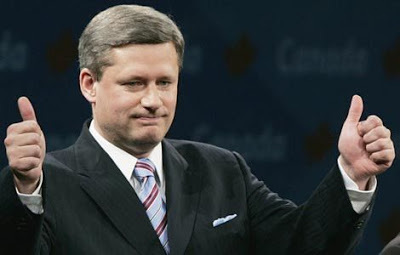 Harper is on a trip to Singapore for an APEC meeting, and India, and will visit China and South Korea in December. But he has turned down an invitation from the Danes to attend an environmental meeting and rebuffed UN Secretary General Ban Ki Moon’s call for world leaders to help break the impasse in talks to cut global greenhouse gas emissions. [hahahaha]Read full story here.Finally, some real good news!